Let the Expat buyer beware! This is especially true in Thailand where the sale of real estate is not regulated and legal documents are written in Thai. 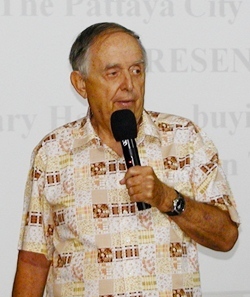 That was the primary message about buying property in Thailand member Gary Hacker gave to his fellow Pattaya City Expats Club members on Sunday, May 1, 2011 at their weekly meeting at the Amari’s Tavern by the Sea restaurant. Master of Ceremonies Richard Silverberg introduced Gary noting that although he has not sold property in Thailand, he has over 25 years of experience in marketing and condominium sales in the USA. Gary was vice president of marketing for Pacific Union Development, the parent company of Pacific Union Brokerage, one of the largest real estate brokers in San Francisco, California. Gary said that when he arrived in Thailand about 15 years ago he was interested in buying a condo, but after researching Thailand’s Condominium laws, he said “no way” as there was no protection at all. But about four years ago he did purchase a condominium; primarily at the insistence of his daughter and there were some advantages to ownership over renting such as being able to modify the unit to your preferences, no increase in rent, no property taxes, and the potential for appreciation in value. Having been a renter for several years and now a condominium owner, Gary said he felt he could pass on some good tips and traps to avoid to his fellow expats that might be “on the fence” as to whether to pursue ownership or to elect to remain a renter. Member Gary Hacker shares with the Pattaya City Expats Club his experience as a real estate agent, and how that might help those interested in buying a condo or renting a property in Thailand. 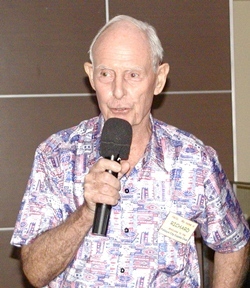 In buying a property, Gary said there are many things to consider – location of the property, direction of exposure to Thailand’s hot sun, effectiveness of the Homeowner’s Association (juristic person committee under Thai Condominium law), inspection of the property by a qualified person, security of building and location, and examination of the Chanute (title document) for valid title and existence of a mortgage. Of these, Gary said the Homeowners’ Association was one of the most important and he mentioned several things to be aware of and to make inquiries about in regard to it. Gary also pointed out that if you buy an existing condominium, you will have a better idea on how well the condominium is run and maintained, the size of the unit and quality of fixtures and appliances. If you buy off a “plan,” there are a lot more pitfalls. Often, developers require deposits and periodic payments from buyers, which they use to pay for construction. Gary gave several tips on the things you need to find out about the developer, their experience and their financing; the weaker the developer is in these areas the more likely that there could be construction problems resulting in either long delays in completion or not being completed at all. If the project falls through, there is little chance that the buyers can recover their deposits. Former Chairman Richard Smith discusses with members the proposed amendments to the agreement with the Amari re use of the Tavern by the Sea for our Sunday meetings. He also provided several other things you need to consider including whether the view can be obstructed by future development and what are the conditions and covenants (restrictions) that do or will govern the condo owner’s rights. He also strongly advised that you have a complete understanding of the purchase agreement; it is well worth it to pay 7,000 to 15,000 baht to get a legal service to review the agreement. Gary said that these are written for the benefit of the developer, so you may want to add some amendments that protect you the buyer; don’t accept it when the sales person says that it can’t be changed – make your changes to the agreement and if they don’t want to accept them, walk away. Gary also offered many other tips including fire security and reviewing the Chanute to be sure the seller actually owns the property – look at the actual Chanute, not a photocopy. Gary then answered many questions from the audience. After which Richard Silverberg updated everyone on Club activities and upcoming events before turning it over to Judith Edmonds to conduct the always informative Open Forum where questions are asked and answered about living in Thailand, Pattaya in particular. Also, for more information about buying property in Thailand, you can visit the Living in Thailand page on the Club’s website at www.pattayacityexpatsclub.com.